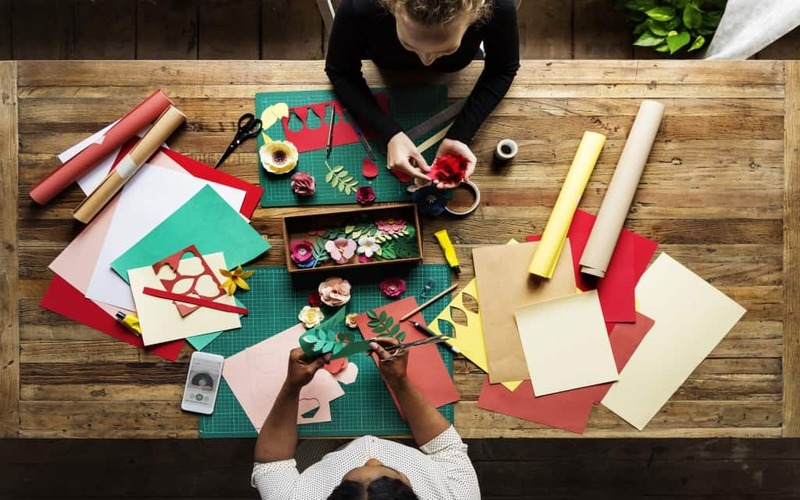 When it is about making crafts at home, many individuals are under the impression that the crafts made at home won’t be as beautiful as store bought items but in reality, if one can invest time and creativity then striking crafts can be made at home. Mothers often have to make a lot of crafts for the kids and handwork purposes. Kids also enjoy the process of creating something with the assortment of materials present before them. However, if the kids are too small, then supervision is necessary while the children engage themselves in craft making. On the other hand, mothers also can take craft making as a hobby where stunning artefacts can be made with the help of craft objects. Imagining something and creating it physically is different. When a person imagines the creation of a particular object, then that is still in the realm of the imagination but while making the same object a lot of effort has to be given. A reverse process can also be followed where the present set of elements kindles an imaginative idea, and the idea is given shape with the given set of things. However, in each case, the idea precedes the creation of the object and for making something, suitable elements ought to be present. The elements needed for creating a particular artefact definitely depends on the idea of the object which is to be created. Hence the primary element needed for creating the craft depends upon the choice of the thing which the person selects to make. However, there is one important thing which is needed for giving shape to any kind of craft or model work, and this is adhesive. The adhesive is not limited to normal glue which is used for sticking papers but has a wide range which is suitable for making different kinds of craft works that include glass, wood filler and cardboard. Thick glue: This kind of glue is usually white and helps in making an even and thick coating on the surface. Suitable for tight pasting and can be used on wood surfaces. It has to be applied in an even manner otherwise lumps will develop. Fabric glue: Cloth is mostly joined with the aid of sewing, but there is a special type of glue which is specifically made for sticking fabric. If two layers of the fabric have to be joined then using this glue for a quick solution is the best possible method to create a dress or other clothing items. The glue is made in such a way that even if the glued cloth is washed then also it won’t disintegrate. This is very suitable for making crafts that include dresses for dolls or puppets. This glue can also be normally used for sticking other surfaces as it is a water-resistant glue. Scratch is removing glues: In one’s household, there are plenty of items which have scratches and those very lines mar the entire beauty of the house. In order to remove scratches, one can choose a pen tipped glue specially made for removing scratches. Once the glue is applied on the scratch, it is then gently rubbed with a piece of cloth. The same process is repeated, and the surface is rubbed with a fresh piece of cloth. Upon rubbing gently, it will be observed that the scratch is no longer visible and the surface has become glossy and shiny. Spray glues: Sometimes it is not possible to ladle glue on a surface and then spread it evenly in such cases a spray form of adhesive material can be used. This kind of adhesive comes in spray cans and can be directly sprayed on the surface. For wooden surfaces, it is very suitable to make an even layer of glue mist. This will help in sticking another piece or object on top of the sprayed surface easily. Glues for artistic effects: If one wishes to turn a plain ceramic vase or other glass or wooden items into something unique and dazzling this kind of glue is extremely suitable. These glues contain two different products one is the base layer of the glue which will cover the entire surface and the second layer is the effect of creating a layer which will cause a crinkling texture on the object. The use of colours can further highlight this. Hence, a wide range of crafts can be easily made with the help of a suitable type of bonding agent. There is a wide variety of such gums in the market, and according to the craft project, proper adhesives can be purchased.